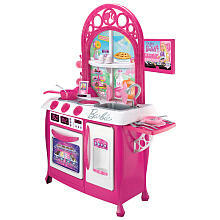 My Family Fun - Barbie Gourmet Kitchen Create a truly gourmet experience! Create a truly gourmet experience! The burners really make cooking sounds when the pot and pan are placed on them. 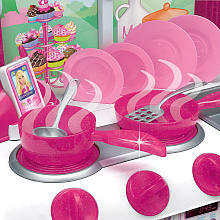 Create a truly gourmet experience while pretending to cook you favorite foods with Barbie Gourmet Kitchen! Barbie Gourmet Kitchen Features Include: Oven and refrigerator create realistic play and give storage space for all of the accessories. 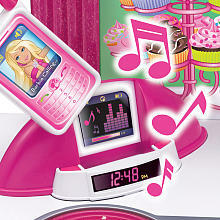 Telephone base unit has a pretend speaker phone with Barbie speed dial, and "TV controls".